Anyway, after seeing these on the blogosphere, I couldn't wait to get swatching them and admiring them in real life. And swatch I did. The poor woman at the register did a double take when she saw the state of my hands (and arms) and went to get me some (a lot of) wipes to clean myself up with. This was the one I decided on. Épatant means amazing in French and in the words of Stevie Wonder, isn't she lovely? I decided to play it smart and pick a shade that I would get a lot of wear out of and this was the chosen one. 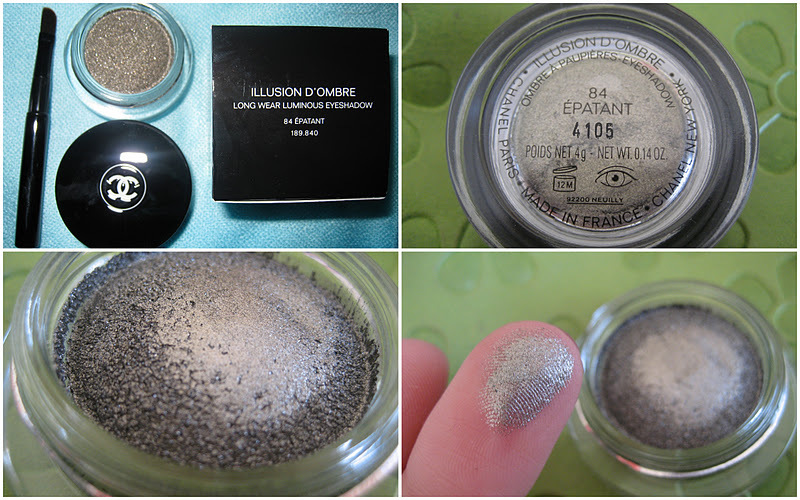 Part of Chanel's Fall 2011 collection, Épatant is one of six Illusion d'Ombre Long Wear Luminous Eyeshadows. It retails at €28 and will last me ages, so in girl maths, it's not so bad at all. The texture isn't like anything else I have in my collection. It's a gel/cream/mousse that's bouncy and soft when you press your finger into it and springs back up, but glides on like buttah. A little goes a long way with this and for the price, it'd want to. I tried applying it with the little synthetic brush that came with it but alas, it was not meant to be and I flung it over my shoulder. I tried applying it with a flat shader brush and a fluffy brush but they didn't pick up much colour, so I got stuck in with my finger and then we were in business. I don't mind about germs, it's only me using it and I'm ok with my own cooties. I like to use my ring finger to apply the colour onto the lid and then use a fluffy brush to blend the edges. Let's talk about the colour itself. Oh, the colour. 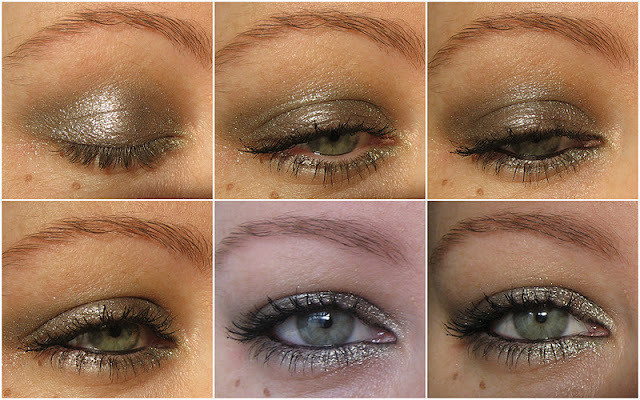 It's got olive green in it, it's got silver shimmer running all through it, it's got grey and taupe undertones to it. I've never come across a shadow that's so multidimensional before and that catches the light so beautifully. It can be applied with a light touch, giving a wash of colour and making it almost a sheen more than an eye shadow. I like to lash it on though! Take a look at it in action. Since I have oily lids at the best of times, I apply a primer every day no matter what I'm using. This lasts for at least ten hours before creasing on me and that's saying something folks. This is Chanel at it's best in my opinion. Whereas some of the other Chanel bits in my collection err on the side of subtly, so much so that I feel like I'm piling the make up on to actually see anything, Épatant gives both subtly and drama, a grand combination. Giving a metallic finish rather than a glittery one, I can wear this to work without people looking like I'm demented and can add a bit of black liner to give the look a bit more oomph. I have my eye on Mirifique ladies, maybe a little treat to myself? This would be a gorgeous Christmas present for some lucky lady. Do we like? Come on, there's nothing like a bit of luxury, especially around the Christmas season! Amazeballs is the only word to describe it Karen. I need this in my life. Seriously. NEED. This looks fantastic on you! I love it. I WANT ALL OF THESE! I have Mirifique but everything else seems to be sold out at the moment, does anyone know of literally anywhere in Dublin that they're selling these? Ohmygod I want it. Now. It's like Graphite in Shadow form. It looks bloody amazing, absolutely stunning colour. Justifies to self, sure €28 is like... €4 every day for a week. Completely acceptable. Getting it.